Combined Toilet & Basin Units. Basic and Luxury Straight Chrome Towel Rails. Our range of Basic and Luxury Straight Chrome Towel Rails offer you quality radiators at unbeatable prices, making them the best value towel rails on the market. If you are looking for a luxury towel rail, our range feature thicker rails and higher heat outputs, giving you a high quality towel rail at a competitive price. We offer an industry leading 10 Year Guarantee on all our products, so you can rest assured that your towel rail will last the test of time. Highest quality triple layered chrome finish. All brackets and fixings included. You can opt to convert your radiator to dual fuel. Send our experienced customer teams a message. Basic and Luxury Straight Chrome Towel Rails Our range of Basic and Luxury Straight Chrome Towel Rails offer you quality radiators at unbeatable prices, making them the best value towel rails on the market. Highest quality triple layered chrome finish 2. All brackets and fixings included 3. Low carbon steel construction 4. Valves are excluded, you can find them. 1 Will this towel rail heat my bathroom? It is a common myth that towel rails cannot heat a bathroom. IBathUK towel rails are uniquely manufactured to provide maximum heat output, without compromising on style and design. 2 Can this towel rail be used on a standard central heating system? IBathUK towel rails can be used on all central heating systems. You can opt to convert your radiator to dual fuel, which will allow you to use the radiator when your central heating is off. 3 What is a Dual Fuel towel rail? IBathUK Dual Fuel towel rails give you the choice of two different energy sources for one towel rail: electric or central heating. This will save you hundreds of pounds each year, as you can still use your towel rail and warm your towels in summer without turning on your central heating! 4 OK, How do I convert this radiator to dual fuel? It is simple and easy to convert one of these towel rails to be dual fuel. Zone - 1 Mainland England, Wales and Scotland Lowland. Zone - 2 Scotland Highlands, Offshore Islands, Northern Ireland. Small Items Dimension is below 1.8m (1800cm) and below 25kg This includes items such as Taps, Showers, Towel Rails, Radiators and Bathroom Accessories. Large Items Dimension is above 1.8m (1800cm) and above 25kg This includes items such as Shower Enclosure, Baths, Furniture, Bathroom Suites. Small Items Dimension is below 1.8m (1800cm) This includes items such as Taps, Showers, Towel Rails, Radiators and Bathroom Accessories. We have teamed up with the reliable couriers Parcel Force. All items are delivered between the hours of 8am - 6pm Monday - Friday. All items must be signed for. Your order will be dispatched by Parcel Force. The courier delivers your order. Townsend Drive, Attleborough Fields Industrial Estate, Nuneaton, CV11 6RU. I do not wish to keep my item - it is not faulty. My item has developed a fault. In the case of goods such as earrings, body jewellery & personal grooming products that have hygiene seals, you must exercise reasonable care by not removing the seals when examining them. For the full terms and conditions please message us. What does this mean for you? In the very unlikely event that one of our products is faulty, you can return it to us for a replacement, up to 10 years after you bought it. If your item does become faulty..
We will need images of the product and fault sending over to us so we can analyze the issue and try to solve the problem. If they are unable to solve the problem they will ask you to return the item for an inspection. ANGLED CHROME TOWEL RAD RAIL RADIATOR VALVES TAPS V01A. Modern Bathroom Mixer Shower Thermostatic Twin Head Set Chrome Square or Round. Chrome Straight Heated Bathroom Towel Rail Rad Radiator - FREE 10 Year Guarantee. Vertical Flat Panel Modern Column Designer Bathroom Radiators White Anthracite. Modern Bathroom Taps Basin Bath Filler Shower Mixer Chrome Round Basin Sink Tap. Want The Best Bathroom Deals? Get the updates from our constant increasing range, our extensive deals and the amazing prices first hand. You don't want to miss out! 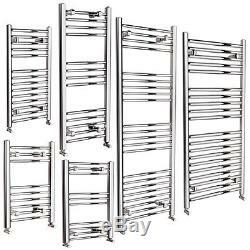 The item "Basic and Luxury Chrome Ladder Towel Rail Bathroom Central Heating Radiators" is in sale since Tuesday, July 23, 2013. This item is in the category "Home, Furniture & DIY\Bath\Towel Rails". The seller is "ibathuk" and is located in GB. This item can be shipped to United Kingdom.